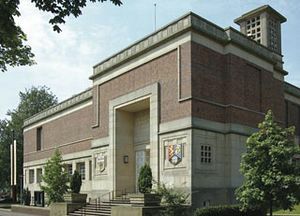 The Barber Institute of Fine Arts has the most outstanding collection of works of art assembled in Britain in the 20th century and is one of the city of Birmingham's greatest cultural attractions. The Institute was founded in 1932 by Lady Barber in memory of her husband, Sir William Henry Barber, a wealthy property developer and solicitor, and was bequeathed to the University of Birmingham 'for the study and encouragement of art and music'. Housed in a Grade II listed building by Robert Atkinson, it was officially opened by Queen Mary in 1939. Since that time, it has acquired a collection of works of art of international significance, displayed in spacious and elegant galleries on the first floor of the Institute. of the greatest names in Western art are represented in the collection, which includes Renaissance masterpieces by Simone Martini, Bellini and Veronese, and outstanding 17th century paintings by Rubens, Van Dyck, Poussin, Claude and Murillo. Among the British artists in the collection are Gainsborough, Reynolds, Turner and Rossetti; and proudly standing at the entrance to the Institute is an equestrian statue of George I, which is the oldest public sculpture in Birmingham. Nearly all the French Impressionist painters may be enjoyed in the Institute, which contains masterpieces by Monet, Degas, Renoir, Van Gogh and Gauguin. Twentieth century paintings include works by Gwen John, Derain, Léger and Magritte. Among the drawings and prints in the collection are outstanding examples by Rembrandt, Beardsley, Schiele and Picasso. There is also a fine collection of sculpture - including works by Rodin and Degas -and of Roman and Byzantine coins, objets d'art and portrait miniatures. 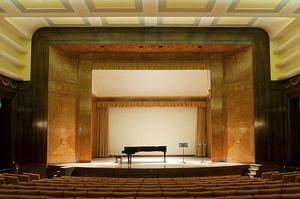 A haven of tranquillity in the midst of a bustling metropolis the Institute has been described as 'comparable to the Frick Collection in New York'. Not all works are on permanent display, please telephone to avoid disappointment. The Barber Institute is located in south-west Birmingham, approximately three miles from the city centre, at the East Gate of the University of Birmingham, off Edgbaston Park Road. Local trains run from Birmingham New Street to University station, a ten-minute walk from the Barber. There are frequent buses (61, 62, 63) from the city centre past the bottom of Edgbaston Park Road. During the day, parking is in short supply on campus, and spaces cannot be guaranteed. South Car Park (off Edgbaston Park Road) is the nearest main car park: it is approximately five minutes' walk away. A £1 charge applies, Monday to Friday, 8.30am - 4.30pm. Free parking is available outside these times on campus around the Barber.